I believe the saying, "You can't go home again." is not always true. I am home again in South Dakota, not in the house I grew up in, but with the people I grew up with. For me that's what makes it home, that and the streets so familiar in the way they look and even the way they smell that I sometimes feel tears bubbling up on my morning walks. I am grateful for the memories that come surging back as I pass my childhood home and the houses of close friends. And I'm equally grateful for the sense of home that continues to grow as I build new memories with my brothers, their wonderful wives and wonderful children. Home, I believe, is a work in progress, not just an historical construct. My grown children are not here this summer, but I appreciate that for them this place will always be part of their sense of home. They have memories of running through the sprinkler on hot summer nights and at Christmas sledding down the hill by my mother's house in the moonlight. They have memories of happy and sad times with their family here. They have created home in this place and with these people and I'm comforted in knowing that "home" for them, as it is for me, is always under construction. This older piece from the Chronicle comes to mind when the Swallow tails show up again in our yard. During one of our hotter summer days I opened the window in my daughter's room and saw a swallowtail fluttering through the top of the birch trees just outside her window. I wondered for a minute if it might be the offspring of one of the butterflies my daughter raised many years ago when she was in high school. In her room she had created a huge butterfly habitat of cereal boxes, duct tape and large "windows" of plastic wrap. She spent an entire afternoon making it after the caterpillars outgrew the jar she'd been using. She filled the habitat with small twigs and fresh fennel sprigs and the nine caterpillars she had found on the plants across the street. Each day she put fresh fennel in and waited patiently. 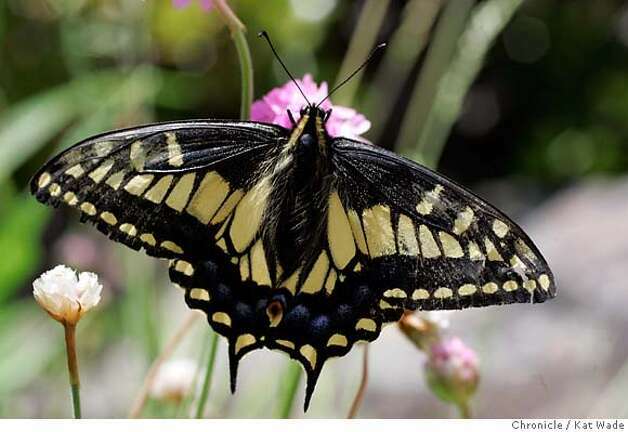 Weeks later, in the same low-key way that she created the incubator, she released the emerging swallowtails. She held one dangling on a twig out her window. "It doesn't seem ready to fly yet," she said and put it back into its safe, temporary home. It got another chance the next day. It was comforting to watch her nurture the caterpillars and to get a glimpse below the surly teenage surface. The tenderness she sometimes tried to hide was still there, still growing. The little things that made her unique had not been neutralized by this stage of conforming with the peer group. I have sometimes thought that the phrase "sweet sixteen" was an oxymoron. Every mother of a teenage girl has prayed for patience. But the connection between her journey of transformation and that of the butterflies was clear and poignant. It was a subtle exercise of faith in nature and in her own emergence. Fewer and fewer children these days are experiencing the luxury - no, the necessity - of this connection with nature. There's a wonderful book on this topic, "Last Child in the Woods: Saving Our Children From Nature-Deficit Disorder." The author, Richard Louv, describes the growing research indicating that exposure to nature is essential to the healthy development of children. A related organization, the Children & Nature Network, encourages projects that help create the valuable connection between children and nature, www.cnaturenet.org. They are part of the "Leave No Child Inside" movement. Kids need this faith in growth and transformation. Though not all connections are as transparent as that of my butterfly midwife, children have a huge need to see their relationship to the ever-changing natural environment and to see how they can be part of it in a positive way. My wondering about the swallowtails hovering outside my daughter's window led me to do some research. Was I being too romantic in thinking that these butterflies might be seeking their ancestral home in a contraption of cereal boxes, plastic wrap and duct tape? I was pleased to learn that swallowtails do in fact return to lay their eggs in the place of their hatching. The butterflies will find fennel plants across the street, but the habitat is long gone and the girl who created it has flown now too. She's moved to Seattle, where she volunteers at an urban nature center for children. And like the butterflies, I'm pretty sure she knows how to find her way back. My grown son was recently helping me in the yard, and as we worked we had a really nice visit. No longer about skate board tricks or a girl in his class, now grown up interests I'm glad to know about. It reminded me of this older article from the San Francisco Chronicle. I heard it a thousand times growing up, "It's easier to do it myself." It came from my mom during an attempt to get one of us four kids to do a chore. She was a patient and gentle woman, so it came out as a statement of fact, rather than an expression of anger. As a child, it made no sense to me. Now, as a mom, it makes perfect sense. It is so tempting to do it yourself, rather than spending twice the time and energy instructing, guiding and doing quality control. Unfortunately, with that approach, you will always be "doing it yourself." And you will be sending young adults into the world who can't take care of themselves. I have come to view the money I pay my children for chores not as a wage, but as a stipend for attending, "Mother's School of Housecleaning and Life Maintenance." Parents are often surprised that simply telling or showing isn't enough to get kids to do their chores properly. It takes a lot of thought, talk and most of all patience. I confess there have been times when I have given up and done it myself or when I've gone back and redone a task. And I've often readjusted my standards or focused upon the process rather than the outcome. In spite of these lapses, I've collaborated with the families I work with and found methods to help get chores accomplished and help youngsters become more competent. First, do whatever it takes to help your child understand how to do the task, or what is meant by a request like "Clean your room." The chances are very good that your idea of a clean room and your child's idea of a clean room are not the same. With little children who cannot yet read, a list that consists of pictures is helpful. Tidy up the room with the child, then sit together and describe what you see. Getting them to see what needs to be done is half the job. Older children are famous for saying, "Looks OK to me." Or for using the laundry basket as storage for something they plan to wear again. The list in words or pictures can be posted in the room and when the parent says, "Clean up your room," the child has the list to follow. e.g., spraying the walls in the shower and letting the cleanser sit while doing another chore in the sequence. Another method of getting the "how" across is to give the children a clipboard and ask them to take notes as the parent straightens up the room and describes what is being done. Kids get a kick out of this, and it helps to illustrate how little time it takes if one sticks to it. When my children were little, I would often ask them to devote just 100 seconds to straightening their rooms. It is amazing what can be accomplished in a focused 100 seconds. Avoidance or resistance are directly related to the perceived size of the job. If it's only 100 seconds, it's easy to jump right in. My son was rather distractible when he was young, so mowing the lawn, including side trips to follow a lizard or to take apart a pinecone, took a long time. One day, instead of asking him to mow our small lawn for his usual wage, I asked him to time me as I did it. He is a good sport and counted aloud as I completed the task in about five minutes. We figured that working at a speedier rate, he'd be getting $36 per hour. It is also important to choose tasks that the child can do. For example, one family I know stores their dishes on a low shelf so that the youngest child can do the chore of emptying the dishwasher. Often some little modification of storage makes a task accessible for a child. When teaching anything, it's important to praise effort as well as outcome. If we withhold praise until the job is perfect, the child will be working for a long time without encouragement. Research indicates that children in school who are praised for effort rather than product do better in the long run. I believe the same applies at home. Families have different policies on paying for chores. Many different systems work. One that works in our house is making chores done "independently" worth more. If they complete the job without any coaching or reminding, the wage is higher. The kids no longer really need supervision, but working together creates a nice opportunity to talk. My son sometimes stops, leans on the rake and says. "Mom, there is this flip kick where you take your skateboard and . . ." Or, "the other day in class . . ." When this happens, I stop too -- and listen. Each family will create its own system, but for many families, these guiding principles help. Make chores doable and clear. Reward a good effort. And try, whenever you can, to do chores together. You may find that it accomplishes something even more important than chores. This older piece from the Christian Science Monitor still applies. Summer may be a time to clean, but if you're a kid it should be a time to get dirty -- without penalty. I don't think I ever got into trouble for getting dirty when I was a kid. That's not because I didn't get dirty. It just wasn't a punishable offense in our house. With a farm next door and a few acres of our own, getting dirty was viewed as an occupational hazard of childhood in the country. My mother's casual attitude may be why most of the kids in the neighborhood hung out at our house. After we got rid of the chickens, we had a great clubhouse in the vacant coop. It was the site of many messy projects, like painting battle hawks on garbage-can lids to turn them into shields. We needed shields for our "wars" with the kids who lived down the hill in Comanche Court. These wars involved a lot of mud throwing. When Mom peeled our clothes off in the evening by the back door, she would comment nonchalantly, "War today, huh?" The back door led to a utility room with a shower (what foresight). We either rinsed off there or ran naked to the tub to scrub off the rest of the dirt. It wasn't just war that offered us opportunities to get dirty. There was also baking: mud pies, mud cakes, mud muffins. And if it was spring and we were very fortunate, we would find a sticky little pond of shiny, smooth mud with which to frost our creations. One summer, we decided to dig a swimming pool. My mother suggested a spot in the front corner of the yard. We dug and dug, and when it was about three feet deep and four feet across, we put in a tarp and ran the hose - for what seemed like hours. The inflow was slightly ahead of the leakage, so it finally filled up. And for about 20 squealing, delighted minutes, we all squeezed in and splashed in the muddy water. A few days after we'd abandoned the pool, we gave little notice to the giant lilac bush that my mother had planted in the hole. The usually dry creek near our house was another wonderful place to get dirty. One spring, a little stream ran down the center of it. We built canals and dams all day long. That evening, my mother had more than mud to contend with. My shoulder-length hair was full of cockleburs. She tried to comb them out. She tried to pull them out, and she finally had to cut them out. This was long before Meg Ryan had popularized the chopped-up look, so the result was pretty strange. It might sound as if we were a bit wild. We were, but as they say in the country, we "cleaned up real good." Maybe that's what my mother loved, uncovering her little cherubs from beneath layers of mud. We still have photographs of us wrapped in fluffy white towels after our evening baths: our eyelashes still wet, and our cheeks shining as if they had been polished. I don't know what was best, the feeling of getting all dirty or the feeling of getting all clean. As a devoted gardener, I still don't. SUMMER ACTIVITIES FOR KIDS? PRETENDING. Summer is here and many children will spend much of it in wonderful, enriching camps and classes. Lucky kids. And other lucky kids will just putter around their yards pretending. “Let’s pretend” were the words that commenced most of childhood play for generations. With rich imaginations children created exotic and fantastic worlds in which they were the main players. Empty packing boxes became all kinds of little shops and vehicles. A line of chairs in the dining room became a bus or train. A bedspread thrown over a sawhorse became our tent on the Amazon. In our own attic was a box of fancy dresses, suits, hats and old jewelry. We became Mom and Dad or duke and duchess. I have nothing against the kind of “enriched childhood” many parents are trying to create. I just don’t want kids to miss the richness that comes from their own unique imaginations. When I see the Kindergarten children in a school where I'm the psychologist with baskets of dress-ups in their play area, I am grateful. This may be one of the few places where these developing minds get to exercise the capacity to imagine. Too often these days children’s imaginations are hijacked by television or by toys that require a specific story line. Children still have these impulses and with a little unstructured time will organize an activity, create and pretend. My daughter was one of those children who absorbed all the tape and cardboard in the house into her creations. One year I gave her a shoebox filled with tape, scissors, cardboard etc. as a Christmas gift. She loved it, managed to use it all up in short order and continued to gather the tape from her parents' secret hiding places. I became convinced that one of the ways we encourage imagination is by tolerating messes. Sometimes the imagination of my children resulted in chaos in the living room, where every stuffed animal and piece of doll equipment became part of some elaborate setting. I must confess that it was often tempting to just let them watch cartoons because it created less mess. On the other hand the mess created from too much media can be in their heads rather that on the living room floor. Much harder to clean up. Some children are natural directors in pretend plays. "You be the princess, and you be the horse and you be the dad." My daughter was one of those directors, and to be allowed to play with her and her friends she would tell her little brother, "You be the monster". It's hard to know what impact her training had on him, but there were times when he played that role too well. Fortunately he escaped the type casting and is now the most wonderful grown son a mother could want. Toys that have multiple uses and, even better, time in the great outdoors can spark the “pretend potential” in children. I hope every child gets to make mud pies at some point in their childhood. Even pretending with them can help. I’m certain that our now grown children became the creative cooks they are because of the hours we spent pretending to be restaurant patrons and ordering wildly exotic dishes. One of the best friends of imagination is boredom. We have to let kids be bored every now and then and let them find inspiring materials around to create there own fun. In these critical times we need rich imaginations to solve our many problems and equally important to bring joy and laughter into the world. Even if it means more messes in the living room -- it's a small price to pay.